Courtesy of Home Team of America, Daniel Murphy. Beautiful Home sitting atop .93 acre culdesac lot. One of highest points in Champions Run. Secure guard gated. Open Floor Plan with Walls of Windows. 4 Living Areas positioned around 5 Bdrs allow for group gatherings or private retreat. Natural light, high ceilings, spacious rooms, split private Master Suite Wing & loads of storage accentuate the home’s positive features. All Living Spaces on Main Floor (except 1 Bdr & 1 Bath upstairs). Feel the breezes out back poolside or under cover. Top rated schools. 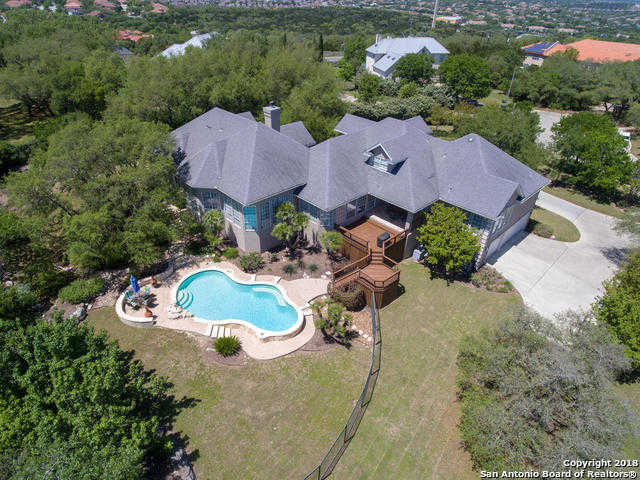 Please, send me more information on this property: MLS# 1305746 – $799,900 – 3 Champions Mark, San Antonio, TX 78258. I would like to schedule a showing appointment for this property: MLS# 1305746 – $799,900 – 3 Champions Mark, San Antonio, TX 78258.